What budding artist wouldn’t grab the chance at a job in Paris to work with the world-famous photo-journalist Lydia Schell? For Katherine, who just finished university, it will also be like going home. This is because, as a young girl, she lived in Paris for two years when her father was dying from cancer. Back then, she stayed with her cousins and their son in a poor part of the city. But the memories of that time – including the cruelty of her cousin Etienne – aren’t going to get in the way of making new ones. This time Kate will be renting a room in the Schell’s house, located in one of Paris’ most classy neighborhoods. So what if Kate doesn’t know what she’ll be doing or that Lydia is a very difficult person? And how hard could it be for a Yale graduate with unaccented and fluent French in the city of every artist’s dreams? Plus, what better time would there be to work with a photo-journalist than just when the Berlin Wall is about to come down? 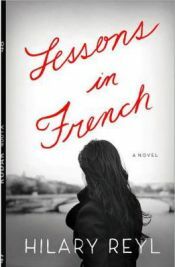 This is the debut novel Lessons in French by Hilary Reyl. The back cover of this book calls it a coming of age novel that is partially reminiscent of “The Devil Wears Prada.” Certainly Lydia is very much a ‘boss from hell,’ in treating Kate more like a dogsbody than an assistant. But she’s not the only one. Lydia’s husband Clarence is working on a book during his sabbatical, and when Lydia is away, Kate must have time to help him, surely? It doesn’t matter that he has his own assistant, the dark and mysterious Claudia, because she is working on her thesis. The Schells also enlist Kate to help their daughter Portia get over her ex-boyfriend, Olivier, as well as care for Orlando – their errant son Joshua’s dog. In short, Kate is at this family’s beck and call, both physically and emotionally. And of course, what would a year in Paris be without a bit of romance included. But with this bunch, even that doesn’t come without complications. In sharp contrast to this, the descriptions of Paris are so precise and vivid, that one can easily envision each and every scene. This shows just how much Reyl loves Paris, and how well she knows it. It is also obvious that this story is one that is very personal to Reyl, but she also uses as a metaphor. Lydia’s photography is described as having the genius quality of making the picture seem as if the scene portrayed is through the eyes of the subject. This is exactly how Reyl gives us Kate’s Paris. Further, Kate learns that a photograph is more about the framing than it is the subject, so too is Paris the frame for Kate. All of which is done with very fluid prose and in a strong voice, for which Reyl must be praised. But as amazing and ambitious as all this sounds, this book falls just a little short. On the one hand, Kate’s naivety persists for far longer than it should, and this delays her personal growth to much later in the story. When the lights finally do come on for Kate, it seems to happen too suddenly, and we’re left blinking after the shock of the flash. This sounds like another excellent photography metaphor, but unfortunately it is unsettling for the reader. It makes us wonder about the incongruous actions of some of the characters, despite their deceptive natures. It also frustrates the reader in wondering why Kate doesn’t “get it” sooner – certainly a Yale graduate can’t really be that dumb. Finally, that ‘transparency’ that Kate displays with such honor, also distances the reader from her, making her less sympathetic. With so many of characters being dislikable, and the few nice ones pushed to the background, the book has a slightly bitter aura to it. Even so, Reyl knows how to get her readers caught up in her settings, making Paris into a magical city we must discover. Overall, Reyl is a talented writer, and perhaps she just needs a story that isn’t so obviously personal in order to allow her to develop it fully. With all its drawbacks, the Paris of Lessons in French by Hilary Reyl makes this worth a read, and the novel deserves a solid three out of five stars. With thanks to the publishers for the review copy sent. No Comments on "Lessons in French"